SpaceX's first Falcon 9 rocket stands vertical atop its Space Launch Complex 40 pad at the Cape Canaveral Air Force Station in Jan. 2009. NASA plansto spend up to $50 million in federal stimulus money to help foster developmentof commercial spacecraft for launching astronauts and cargo into space. Under theplan, NASA will competitively award Space Act agreements to promising privatecompanies to boost their commercialspacecraft work. NASA said last week that it intended to issue a formalCommercial Crew and Cargo Program solicitation. Proposals will be due 45 dayslater with multiple awards expected in November. Inmid-July, Congress signed off on the agency's plan to spend $1 billion inAmerican Recovery and Reinvestment Act funds. Of the $400million in stimulusmoney set aside for NASA's manned space exploration programs, $90 millionwill be spent on crew and cargo efforts, including $50 million to be spent onmultiple, competitively awarded Space Act Agreements intended to fosterprivate sector growth in developing human spaceflight capabilities. "Theseefforts are intended to foster entrepreneurial activity leading to job growthin engineering, analysis, design, and research, and to economic growth ascapabilities for new markets are created," stated an Aug. 4 announcementissued by NASA's Johnson Space Center in Houston. NASA waitedmonths for lawmakers to approve the spending plan, which was submitted toCongress in April. Congressional and industry sources said the funds were heldup by Sen. Richard Shelby (R-Ala.), who wanted all $400 million for explorationto be spent on Constellation, NASA's effort to replacethe space shuttle with new systems. These include the Ares I and Ares Vrockets under development at the Marshall Space Flight Center in Huntsville,Ala. NASA hasalready pledged to buy commercial cargo launch services for supply runs to theInternational Space Station from two private firms: SpaceExploration Technologies (SpaceX) of California, and the Virginia-basedOrbital Sciences, Corp. 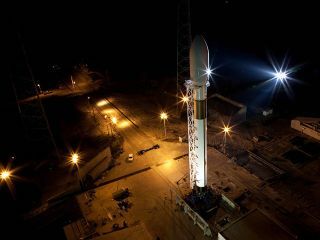 The initialcontract awards call for SpaceX to provide 12 flights for $1.6 billion, whileOrbital Sciences would provide eight flights for $1.9 billion. The contractsrequire the two companies to launch a total of 20 tons of cargo each to the stationthrough 2016.